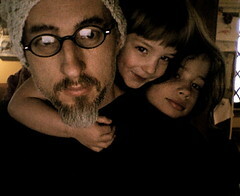 Feeling the weight of fatherhood and I like it. I have been doing the laundry by hand off and on lately. I bought a washboard and a wringer and I love the deep connection I feel with my arms and hands deep in the warm suds. Yesterday Dove pitched in getting the deep stains out of the socks with felsnaptha soap. The beautiful yellow bar that comes wrapped in papper. Grace and Rain are making all kinds of noise right now waiting for dinner to get done, banging their silverware on the plates. Now their silverware have become people and they furnish the voices and move them around. Tonight it's a chicken dinner with gravey, mashed potatos, salad, and european thick crusted bread warmed in the oven. Brenda puts the finishing touches on dinner while I type these lines. Umm, it smells good!